It's hard to think about Christmas without including holiday music. Recently, I wrote a review of the 1969 Christmas episode of the Glen Campbell Goodtime Hour and it was well received so I thought I'd write another. Anyone else a Dean Martin Show fan? 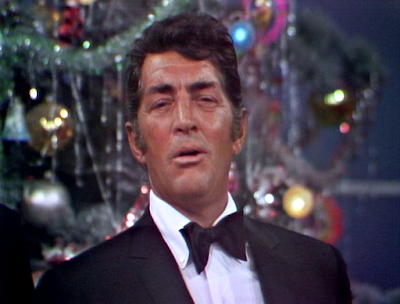 Let's take a look at the 4th season Christmas installment of The Dean Martin Show from 1968. 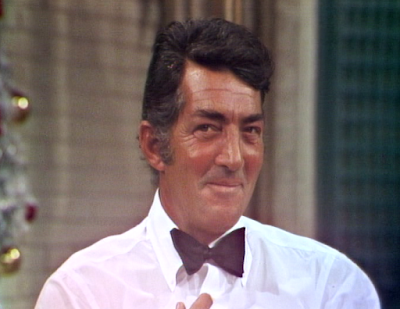 The Dean Martin Show ran on NBC from 1965-74. There seems to have been a resurgence of TV variety shows in the past couple of years. Not only have numerous retro Christmas TV variety show episodes and specials been newly released on DVD, including this 1968 Christmas episode of The Dean Martin Show, but the TV network GetTV aired quite a few holiday variety specials during December last year. I sure hope they repeat that trend in programming this year. 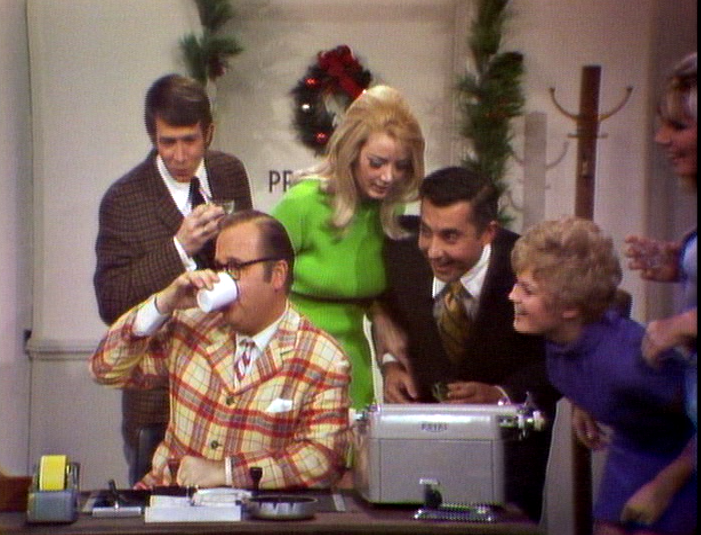 There's still a wealth of Christmas variety entertainment from the past that hasn't aired on television in decades! 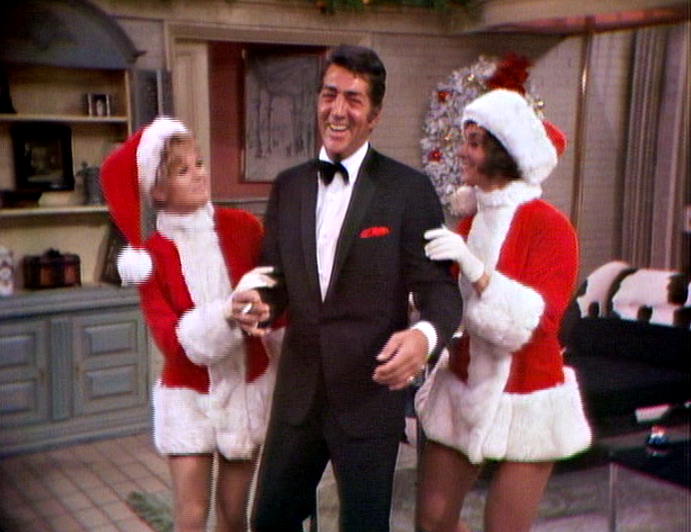 Let me remind you about the 1968 Christmas episode of The Dean Martin Show. Dino transforms into Kris Kringle. The show opens with the show’s background singers dressing Dean Martin in a Santa Claus costume while they sing “Look At That Face" followed by “Be A Santa.” As the song continues, the number turns into a dance production of happy Santas. Fear not--you're seeing that correctly. 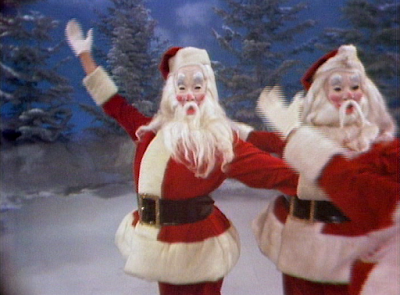 These dancing St. Nicks are each wearing a face mask. 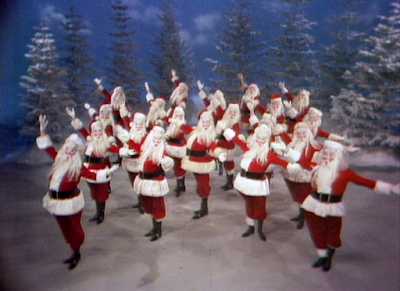 I'm guessing that the creative decision to wear masks was made in order to attempt to give each Santa an identical appearance--without intending to scare viewers. 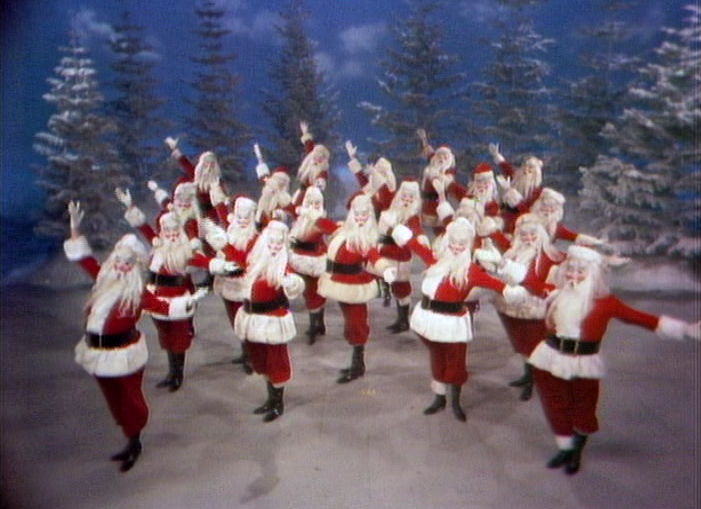 The dancing masked Santas are interrupted by short comedy sketches with this episode's guests: Dom DeLuise, Bob Newhart, and Dennis Weaver. The opening sequence comes to a close when Martin arrives center stage riding Santa's sleigh pulled by a gorgeous team of reindeer. 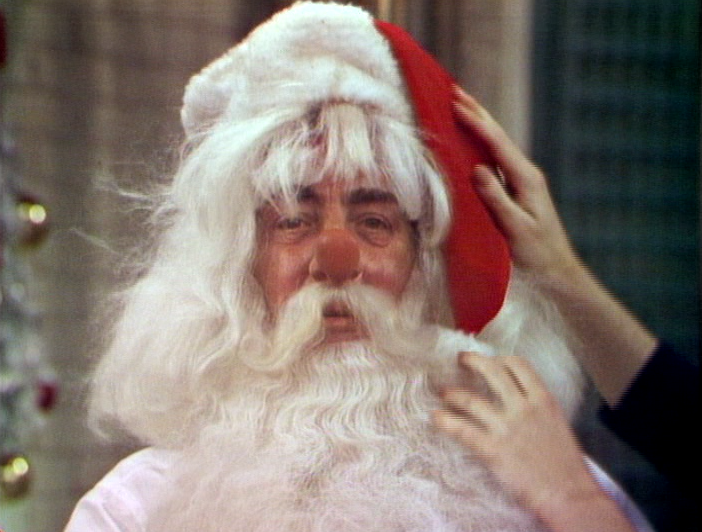 Dean's not afraid of a stage full of scary masked Santas. Dean is filled with the holiday spirit. 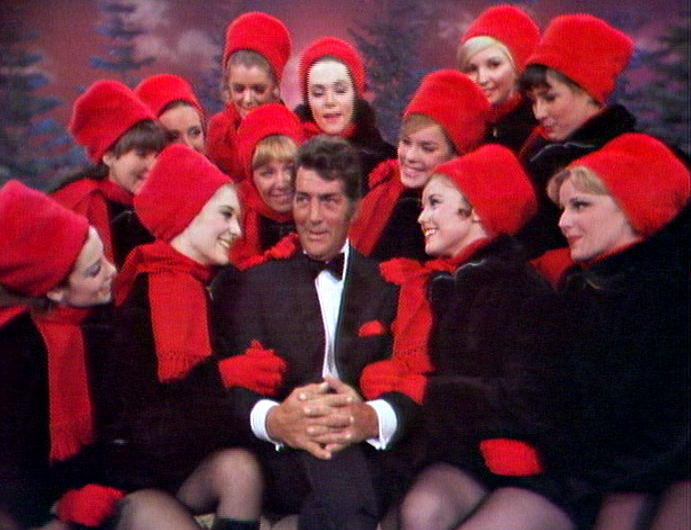 Next, Dean Martin sings his signature holiday song "It's a Marshmallow World." He's relaxed and freely joking around during the song's performance. His female co-stars in this scene are dancing along side him--even pinching and tickling him--as he mugs into the camera and acts silly. The in-the-moment behavior creates a fun, easy-going, and fresh performance. Viewers can easily tell that the performance and song is taped live and not synced to a recording. An entertainer has to be a strong, confident performer to pull that off. And, Dean is smoking a cigarette while singing and clowning around. They don't make TV like this anymore! Comedian Bob Newhart doing what he does best--creating an awkward conversation. This is followed by Dean joining Bob Newhart in a comedy sketch about an embarrassed man awkwardly asking to return a gift toupee at the department store during Christmas time. 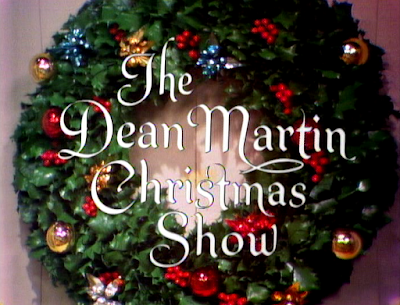 Dean repeatedly breaks character laughing during the sketch. It's comedy gold. The wardrobe budget for this episode must have fallen short--The Golddiggers perform without pants. 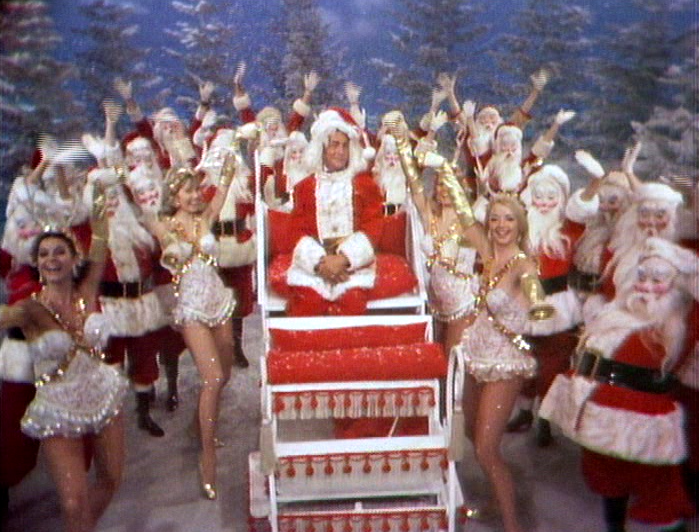 Next, the lovely Golddiggers take center stage and sing "Santa Claus is Coming to Town." Then Martin joins them and together they perform a medley of the standards "Daddy," "True Love," and "We Wish You the Merriest." Dino surrounded by The Golddiggers. 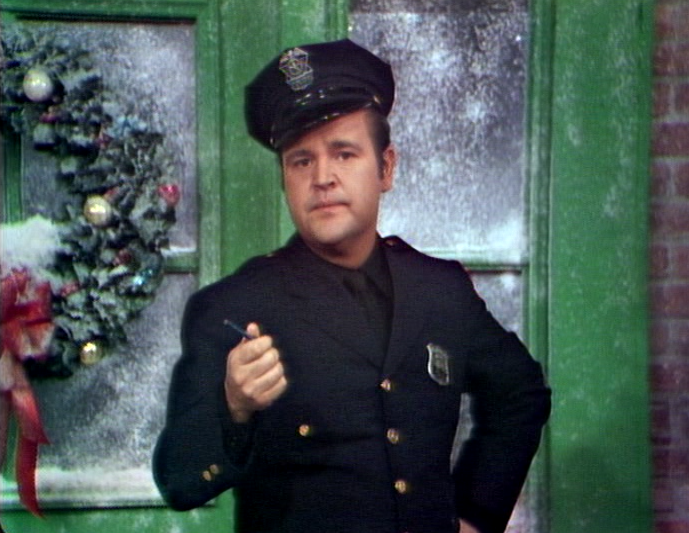 In another comedy sketch, Dom DeLuise plays a policeman giving Santa Claus a parking ticket. This is immediately followed by another sketch with Dean and Dom playing two hobos on a park bench at Christmas. This episode was filmed thirteen years before DeLuise and Martin would share the screen again in the movie Cannonball Run. Martin and Lane frequently perform a song together on The Dean Martin Show. 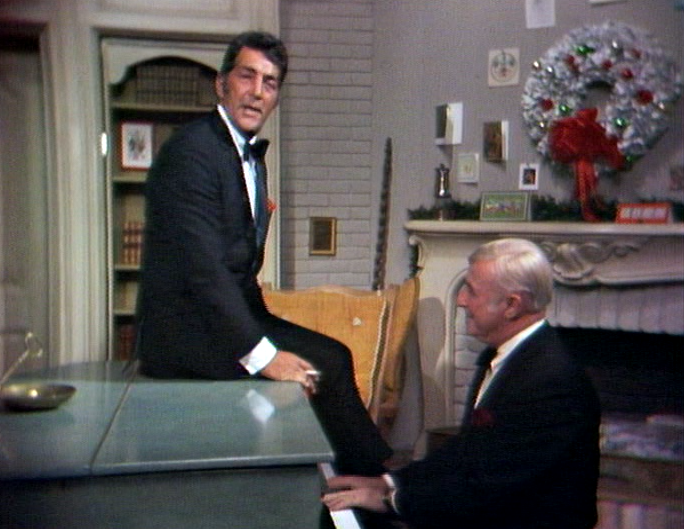 Dean returns to the set to join pianist Ken Lane to sing "Jingle Bells." This is followed by surprise guest Bob Hope who emerges from the closet to exchange comedic barbs with Dean. 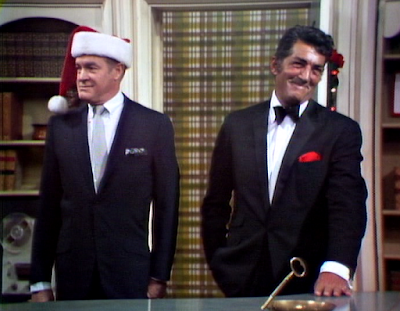 The closet gag with a surprise guest is another recurring element on The Dean Martin Show. DeLuise returns once more for another sketch--a pantomime bit about an unruly office holiday party. 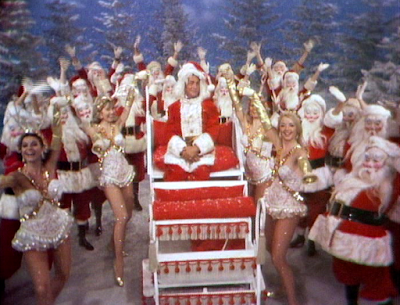 Bob Hope is well-known for his own NBC Christmas TV variety specials. DeLuise plays an office worker whose coffee is spiked with alcohol during the office Christmas party. Dino shares a few on-screen moments with the cast & crew's children. The kids are hilariously unpredictable! 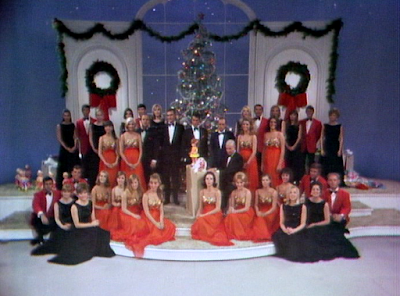 The musical finalé brings Martin, the guest stars, The Golddiggers, the background singers and dancers, and the children of the cast and crew together. Dennis Weaver sings “The Marvelous Toy” accompanied by the children who play along with simple instruments such as whistles and tambourines. Tom Paxton wrote "The Marvelous Toy" song, however Peter, Paul, and Mary's version may be the most familiar. The Golddiggers are dressed in orange. DeLuise, Weaver, Martin, Newhart, and pianist Lane are in the center. Martin solos on the beginning of "Silent Night." 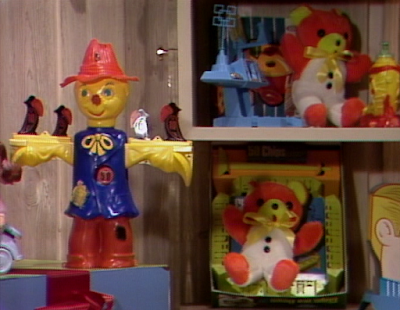 During the song "Christmas is for Kids," the camera pans across a roomful of toys on display. This segment is an eyeful for viewers like myself who crave to remember the hot toy trends of 1968. 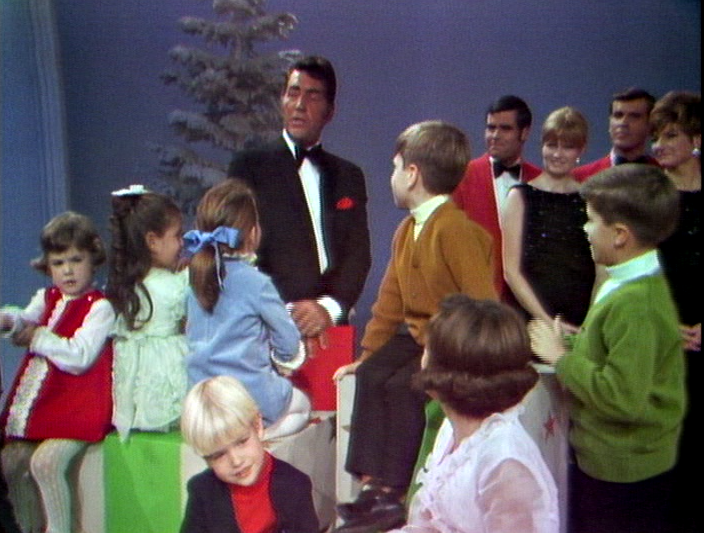 "Christmas is for Kids" serves as a segue for Dean Martin to introduce a charity toy drive he's involved with. After he announces that more than $100,000 worth of toys have been donated to hospitals and orphanages across the country, Dean identifies a hospital in his hometown of Steubenville, OH as one of the locations. This is followed by more video clips of his celebrity friends announcing 39 more locations across the country where the toys will be donated. Celebrities including George Burns name hospitals and orphanages in cities from coast to coast to receive toy donations. The long segment of celebrity video clips is impressive. 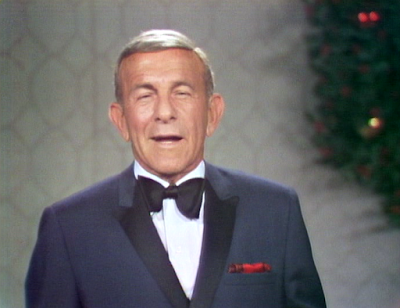 In addition to Martin, hospital and orphanage recipient announcements are made by George Burns, William Holden, Tony Bennet, Vince Edwards, Gale Gordon, Phil Harris, Dom DeLuise, Charles Nelson Reilly, Nancy Sinatra, Johnny Carson, Bob Newhart, Glenn Ford, Glen Campbell, Greg Morris, Raymond Burr, Kay Medford, Peter Graves, Don Rickles, Lorne Greene, Petula Clark, Barbara Feldon, Dennis Weaver, Rowan & Martin, Dan Blocker, Roy Rogers, Joey Bishop, Michael Landon, Jim Nabors, Diahann Carroll, Andy Griffith, Frank Sinatra Jr., Red Skelton, Paul Lynde, Kate Smith, Tennessee Ernie Ford, Jimmy Stewart, Jack Benny, Bob Hope, and Lucille Ball. 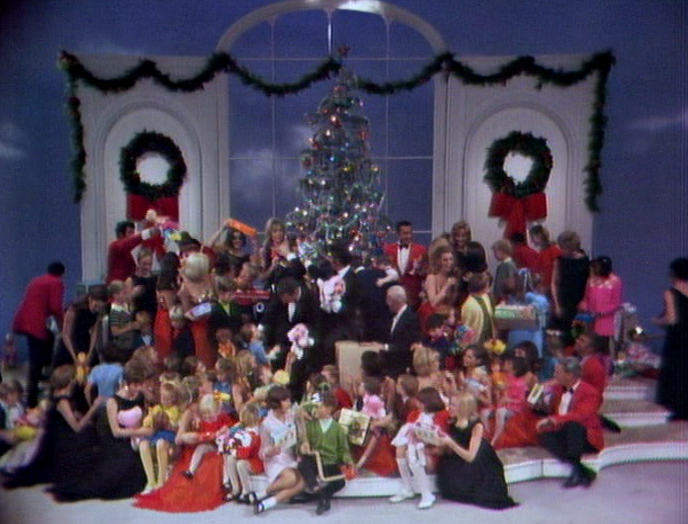 One can only hope the overwhelming endorsement of the toy donations inspired viewers at home to give generously at holiday time that year as well. 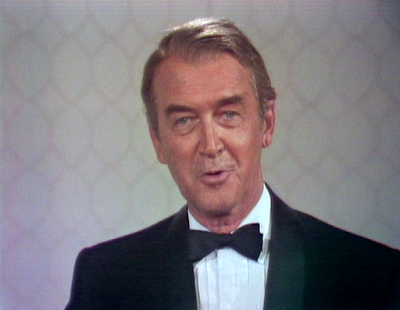 Jimmy Stewart is one of the celebrity announcers as well. I think a great many needy children were made merry at Christmas in 1968. It's chaos under the closing credits as gifts are handed out to everyone on stage! The show closes with the group singing "We Wish You a Merry Christmas." 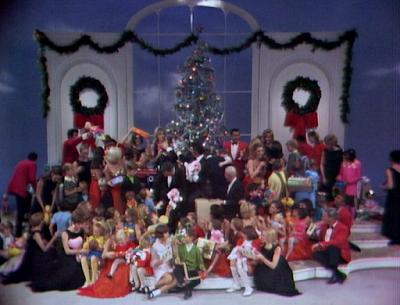 Toys from under the Christmas tree on set are handed out to the cast and children while the closing credits roll on-screen. 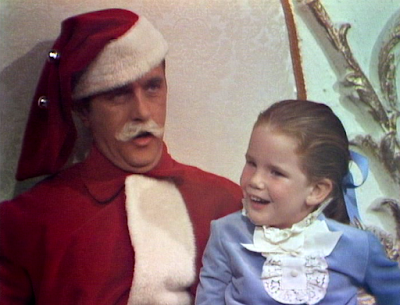 Recognize the little girl sitting on Santa/Bob Newhart's lap? 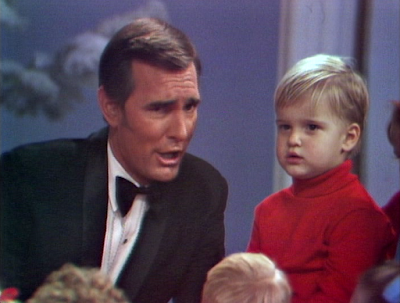 Sharp-eyed viewers may recognize a few familiar faces in the crowd of children in this episode. A beautiful and confident little girl in a blue dress captures the camera's attention several times. She's sitting on Bob Newhart's lap in a comedy sketch at the beginning of the episode. She's also quite visible during the finalé as she hugs Dean Martin, and corrects Dennis Weaver about the order of the instruments within his song. She tells Dennis Weaver that the whistles in his song come before the tambourines! Hold on to your hats--that's a four year old Melissa Gilbert (from Little House on the Prairie and many TV movies). What is she doing on Dean Martin's Christmas episode? Her grandfather is Harry Crane--a head writer on The Dean Martin Show. Another adorable child in the crowd draws attention to himself when he won't stop laughing! 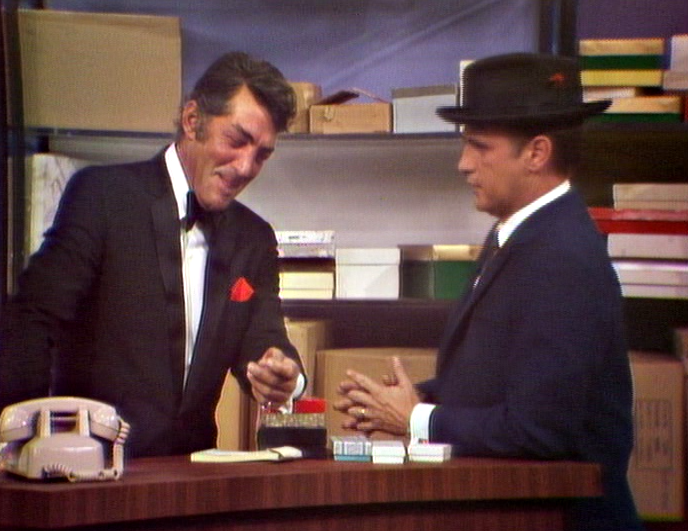 Dean Martin asks him "Have you got a favorite singer?" The little boy replies in the negative--and just keeps laughing! 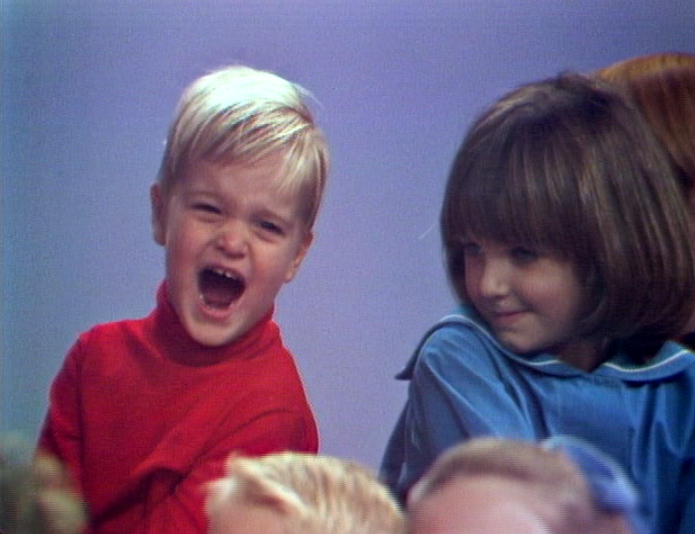 I think that cute blonde boy is two year-old Peter DeLuise, the son of comedian Dom DeLuise. (Peter eventually starred on 21 Jump Street and now directs TV). Weaver sings to the young DeLuise too. 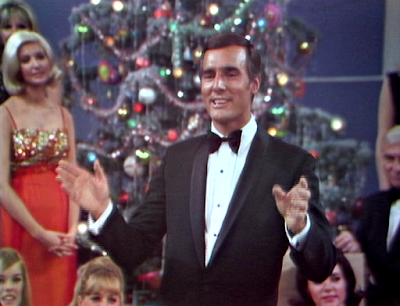 Many TV variety shows have incorporated the cast and crew's family and children into the Christmas episodes. I've seen it on done by Lawrence Welk and his Champagne Music Makers, Glen Campbell, Johnny Cash, Andy Williams, Sonny & Cher, the King Family, and others. Isn't it revealing and personal for entertainers to share their loved ones with TV viewers at Christmas time? Great piece - this show looks wonderful. 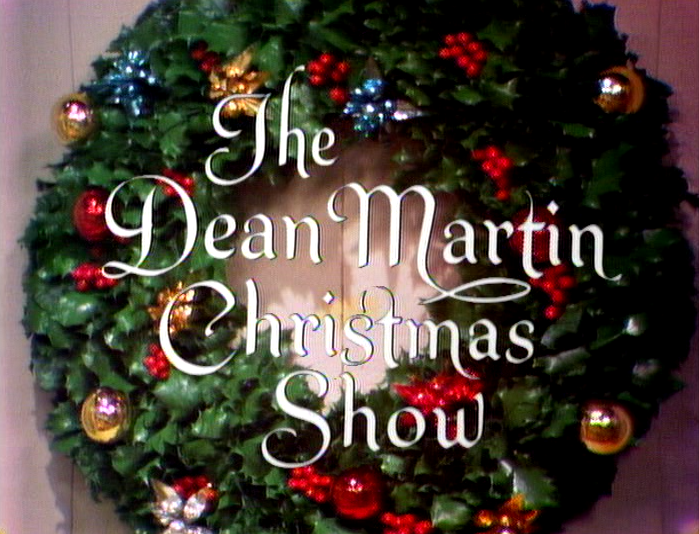 I only remembered Dean's "Christmas in California" specials that I believe aired after his series left the air. Miss Wilson what a great pairing of pictures and prose celebrating this delightful Dean Martin Christmas Special. Never was, never will be anyone as cool as the King of Cool....oh, to return to the days when Dino walked the earth. Know that your energetic efforts have been shared this day at ilovedinomartin. Such a wonderful post! Thanks for these memories. the Marshmallow world song ,who were the 2 ladies names? Do you have the names of the 2 ladies dancing with Dean Marshmallow world! I just saw this last night on Youtube along with the Martins/Sinatras special and followed it with A Very Murray Christmas. This show was the best of the three.